On May 29, 2006, a positive list system that prohibits the sales of foods with any residual pesticides, feed additives and veterinary drugs in excess of fixed amounts was created. As a result, criteria for residues in foods and analytical methods were determined for about 800 pesticides and veterinary drugs. This number is expected to increase further in the future. LC/MS/MS is often used for these analyses. 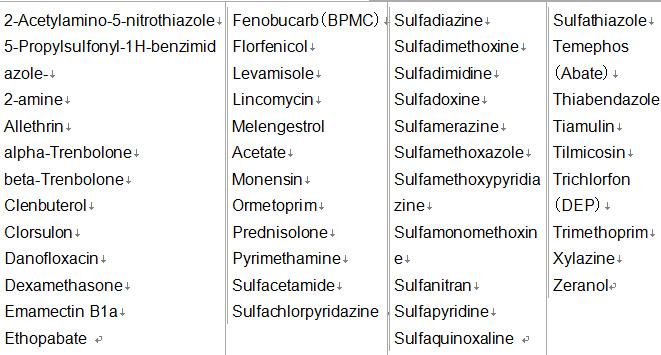 This method package is pre-registered with analysis conditions and compound information of target components for 42 veterinary drugs for which residual standards and LC/MS analytical methods have been set in the positive list system. Analysis can now be started without performing difficult or time-consuming tasks required in LC/MS/MS analysis, such as evaluating the separation conditions and optimizing the MS parameters for each compound, to allow efficient batch analysis of multiple components. 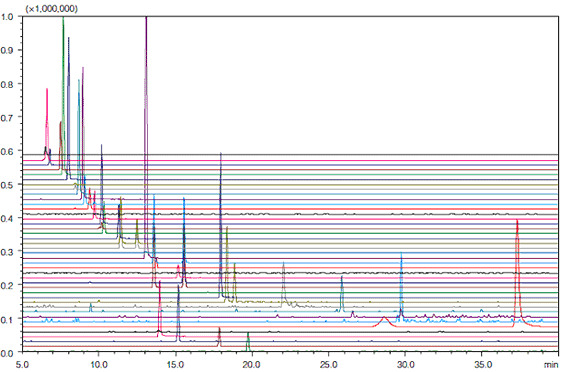 The following shows an MRM chromatogram obtained using the batch analysis method file for veterinary drugs. Be sure to perform tests using standard samples to confirm qualitative and quantitative information obtained with the given system.